Krystal Scott in action during Winter Series Game 2 against GWS. For Krystal Scott, there’s no better feeling than pulling on your Club's guernsey for the first time. After being drafted as a rookie for AFLW Season 2, Krystal Scott has re-signed as a main list player for 2019 and represented the Lions for the first time in the Winter Series. “It was unreal, the experience was unbelievable,” she said. Scott believes the team's great culture and work ethic is evident onfield after two wins in their opening two games. 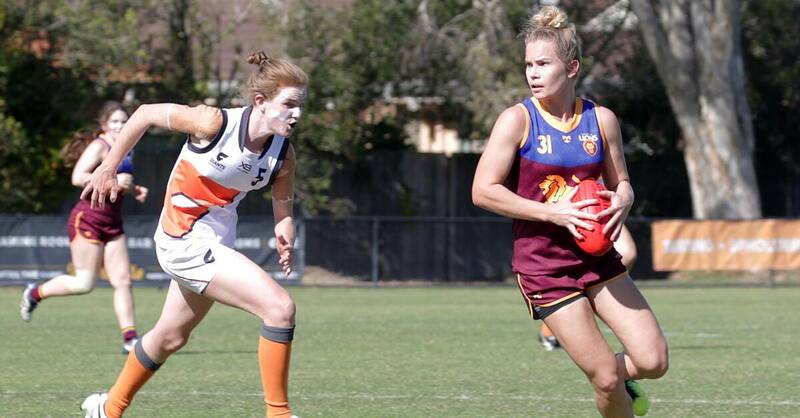 Her first game in Lions colours was just another step on Scott’s journey to playing AFLW. The sports nut grew up kicking the footy with her brothers before moving to America on a tennis scholarship only to return home and be drafted after an outstanding first season with Bond University in QWFA Division 1. Scott’s rookie list position meant she was relying on her teammates misfortune to have a chance at selection. But her work ethic convinced coaches she deserved a main list spot for 2019. “It was really tough, I was training hard every week but until someone gets hurt, which is obviously not what you want to happen, you can’t play,” she said. The team environment is new to Scott after years of playing solo tennis. Scott says the addition of teammates helps make it easier to stay motivated and keep working hard day in day out. “I find football a lot more enjoyable because you have that team around you which makes it easier to perform at your best,” Scott said. She thrives on new challenges. Her most recent venture involved travelling to Japan for the Padel World Qualifiers. “My best friend and I used to play tennis then padel came up as a new sport in Australia,” she said. Though Scott’s passion lies with footy as she looks towards AFLW Season three and her dream of debuting. “I’m really focused on continuing to improve and hopefully getting games in AFLW 3.0,” she said. The Lions AFLW team will play their final Winter Series match on Saturday against the Gold Coast Suns at Metricon Stadium. Lions Season Members and AFLW Members will be granted access to match via their membership passes. Lions spectators are welcomed to sit in General Admission bays 144 and 145. Entry to the Winter Series clash must be by 5.30pm at the latest. The match will be a curtain-raiser to the Round 17 AFL clash between Gold Coast and Essendon. Lions Season Members and AFLW Members who attend the Winter Series match (entering the stadium before 5.30pm) are permitted to stay and watch the AFL match without having to purchase a ticket. Head to the Lions AFLW Twitter account for score updates throughout the match.